Which is why I am against a second referendum. It seems one half of the population will be left angry and bitter behind, no matter who wins...disunified and hating the other, what a legacy! If you mean these forecasts then they show the UK as the worst performer in the EU for 2018 and 2020 - let's see how reality pans out but it does not look good. Most people in the UK do not want it to get on an leave. There is more support for a second referendum or for scrapping Brexit than there is for no deal. There is more support for a second referendum or for scrapping Brexit than there is for no deal. The second referendum came about 40 years after the first one. I think it would be about right to wait another 40 years till the next one. Mind you,I don't think The EU will still be around by then...........and neither will I........LOL!! How do you think Europe will look like in 40 years? What culture? Are you saying there is a one culture shared by all people with a dark skin tone? Where is evidence for that? are a cohesive group with their own traditions and pride in who they are. Really? So you wouldn't have a problem to point out few examples of that pan-black culture and their common heroes or 'folk singers' ? By the way there is about 20% of the Polish people that are steadily opposed to Poland's membership ion the EU. The latest poll as you should know showed that that number increased to about 33,33%. There's a key difference between the original referendum and the shambles in 2016. In the original, nobody's ever even slightly suggested electoral fraud. In the 2016 shambles, it's proven. The latest poll as you should know showed that that number increased to about 33,33%. Yes Ironside. That needn't concern you, as you don't live here. And it doesn't concern them, as they still live in the village, tending to grand-daddies' farm. Still the most likely (and desirable outcome) I would have thought, if the institutions win out - which they probably will. Are you saying that? Nobody else is; we were talking about African Americans, a distinct group with a shared history. There you go again. Who mentioned your 'pan-Black culture'? The Polish government's poll, as carefully explained in this thread, shows 92% approval for membership. Of all the EU member states, it is Poland where support levels are so high. Quite. A distinct group with a shared history. 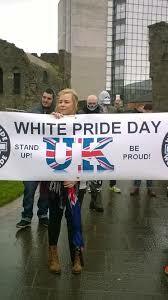 Try to organize "I am White and Proud" parade anywhere outside of Russia or Eastern Europe and tell us how it went. First, what happened when you tried to get the permit and, then, the parade itself. 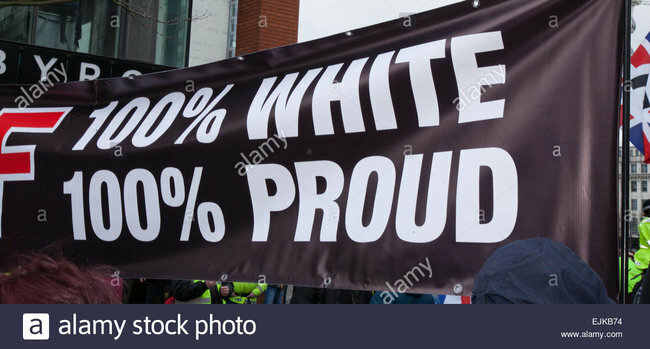 If that's too much effort, how about just a bumper sticker: White and Proud. You can make one in ten minutes. Then, post a picture of your car the day after. Independent states in an economic group. I even have a name for it. Maybe you are right. But it will be some kind of union...it will have to. The world isn't waiting for the Europeans and their quabbles. The building of huge economical blocs is well underway, just look to Asia...how should one lone european country stand up to that??? Anvil or hammer, that's the question! Try to organize "I am White and Proud"
Why would anyone need or want to? What Europe needs is hit the bottom. Like one country with a Muslim majority for the rest of the Euromorons to take notice and say: Oh, f***, what have we done. In the meantime, let's appreciate that it was the neighbor's daughter not yours who was raped. A bucket of sand will help, too. In your opinion, those pictures are a proof of freedom or racism? You could have answered my question with just one word. Instead, you slithered with that equivalent to read 160 posts evasive move. Surely you've read them all already, having commented on most pages in the thread. You can wiggle all you want with somebody else. One word is all I am asking for for the last time or I will be charged with baiting. So, no essays, no wiggling, please. I see no wiggling, just a straight answer. No reason to re-read the thread for you. I see no wiggling, however yes, those pictures are certainly, doubtlessly and incontrovertibly pictures of organised racists. We are done. NoToForeigners is right. To NoToForeigners: anyone with four A's has my respect. They don't deserve any better as this last encounter shows so clearly. Nothing to do with class - the etymology of the term......disgraceful as it is in the above case. I suspect it was written by the Asian community , as both minorities are vying for the same crumbs from austerity. Blame the Tory government for that. On the other hand, a future Ph.D. walking briskly to the local library to prove that blacks are as smart as whites. 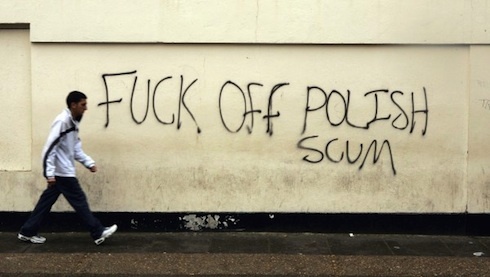 Would be better to blame all the politicians as they are scum. Latest news in the UK is that politicians get a hotline to the Tax office with no longer than a five minute wait to do their Tax returns while the rest of us plebs can wait for one or two hours. No one on either side of the house has stood up to say this is unfair, pigs in the trough and they are more equal to the likes of both you and I. ... in the UK politicians get a hotline to the Tax office with no longer than a five minute wait while the rest of us plebs wait for hours. And this is a problem in the UK? If so, your swamp are angels compared to the US rodents. Here, they promptly exempt themselves from the s*** they shove at us. Like the Obongo's ACA. My apology for an off-subject comment, but somebody has to make sure here that things are kept in proper perspective.